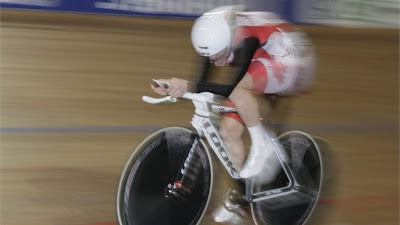 LONDON, England -- Canada's women's pursuit team set a Canadian record and guaranteed itself a medal at the UCI Track Cycling World Cup on Thursday, finishing first in the qualifying heats. Competing in London's Velodrome -- the venue that will host the track cycling events at the upcoming London 2012 Olympic Games -- Tara Whitten, Gillian Carleton and Jasmin Glaesser finished their heat in 3:20.785 to set up a Friday evening gold-medal final versus the home crowd favourites, Great Britain. "It’s a really exciting time for our team right now," said Whitten, who is also a podium favourite in the women's omnium, which begins Saturday. "When we had our trials in LA, we saw that all five of us are produced fast times. It makes the decision really hard for the coaches, and pushes us to be at our best every day, and makes the team a lot faster. Canada raced early in the schedule, as the fifth of 15 heats, and the venue was almost half empty as the team began whipping around the bends just after 6 p.m. GMT. It was the fifth heat ever run on the Olympic track. As the splits started show better-than World Record times, however, the crowd's initially lacklustre cheers started to gather intensity. Canada went on to finish 1.22 seconds outside of the record time. "What struck me most tonight was the crowd," said Carleton. "You can tell the people here are crazy about cycling. I could hear during the race the announcer amping the crowd with every split that showed up on the time board, which I would normally never do. "I just thought that was the most motivating to do. It’s very exciting to hear when you’re on pace for the World Record, but at the same time, it doesn’t register too much, because we're still focused on the execution of the plan, and what we’re supposed to do. It’s still a great morale boost." Track cycling has been one of Great Britain's most successful Olympic endeavours, with four-time Olympic champion Sir Chris Hoy and world champion Victoria Pendleton headlining Britain's men's and women's teams, respectively. Due largely to the team's success on the track, cycling is expected to be one of the most popular events of the London 2012 Olympic Games. By the time Great Britain rolled its bikes onto the track for the second last heat of the day, the venue was packed and the crowd was roaring. Britain's riders, Laura Trott, Wendy Houvenaghel and Joanna Rowsell quickly caught Canada's lead. By the end of the first 2,000m, Great Britain was eight-tenths of a second in the lead. British fans pushed their riders at every split but, despite the home-crowd support, Britain fell behind in the final 250m of their heat. Canada will race against Britain in the gold-medal final scheduled for Friday. Australia will face the Netherlands for bronze. The UCI Track Cycling World Cup continues through to Sunday. CTVOlympics.ca's Jennifer Lukas is in London this week, reporting on the UCI Track Cycling World Cup and Olympic test event from the Velodrome. Follow her updates on Twitter at @JenniferLukas and join in the conversation at @CTVOlympics.